“No pictures on the scorecard” is one of my father’s favorite expressions. It comes from golf and (as I understand it) basically means that people only see end results, without knowing how you arrived at them. He usually invokes the phrase when someone tries to dismiss an accomplishment as easier than it sounds. (Because a hole in one is a hole in one, regardless of how short that hole was—no pictures on the scorecard.) But it goes the other way, too: maybe a terrible result masks the fact that you’re playing with pain, and that playing at all is an accomplishment of sorts. Despite my wide-ranging knowledge of golf expressions, I am not athletic. I dreaded gym class in my elementary and high school years, hoping that it would be a “fun” day (dodgeball, wiffle ball, or Richard Simmons Sweatin to the Oldies aerobics) and not a “why didn’t I fake illness?” day (field hockey, basketball, or running). And running was the worst. In elementary school, running meant multiple laps around the athletic field, trying to linger as long as possible on the side lined with trees that provided shade, delaying the inevitable moment when I’d be back on the dry, sun-drenched stretch. The athletic girls in my class would blow past the other stragglers and me, completing their laps and relaxing on the grass (in the shade!) while Ms. Porter clapped her hands and implored all of us still running to “hustle up, girls!” My single goal on running days was not to finish last. So when I signed up for a “run/walk” 5K this weekend, I was a little worried it might be a replay of gym class. But I had reasons to do this. I’m trying to get more exercise, as I have a lot of grad-school weight to lose. 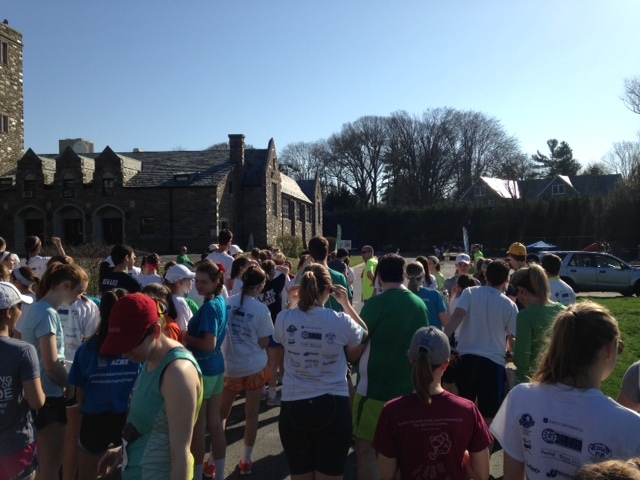 The 5K was organized by my high school, Merion Mercy Academy, and its goal was to raise money for a Mercy-supported girls’ school in Sudan. And I had three of my closest friends doing the 5K with me; the four of us registered as “Team 2000.” The “run/walk” aspect of the race was also reassuring; I knew I couldn’t run it, but wasn’t worried about my ability to walk 3.2 miles at a reasonable pace. 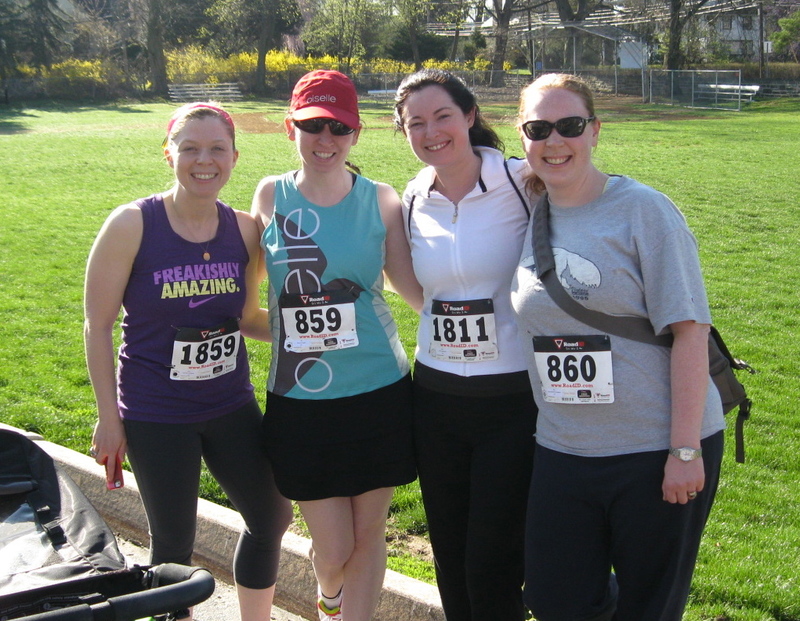 So on Saturday morning, I showed up at Merion and collected my race bib and “MMA SuDash” t-shirt, then met up with my three teammates: Maureen (a really serious runner), Jackie (also a runner, and even more impressive because she runs while pushing a jogging stroller and almost-two-year-old), and Moira (who was walking with me). We strolled down to the starting line on the school’s lower campus, amassed in a big crowd loosely separated into runners at the front and walkers in the back, and waited for the air horn to sound. We were off. The registration for the race promised a “fun, flat” course, and I had an idea in my mind of where we’d be heading. I turned out to be completely wrong, and the course was anything but flat. We wound through Merion’s campus and then crossed the street to enter the neighborhood behind the school. One hill after another, and they were steep. As Moira and I started up the first hill in the neighborhood, two cyclists came up behind us and called out, “first runner! First runner!” We moved to the side and watched a teenage boy run past us. We were barely into the off-campus course, and he was already on his second lap. It’s like gym class all over again. But we kept going, which was reasonably easy for two reasons: (1) the two of us walking together meant we each had someone to talk with and motivate us, and (2) Merion had stationed race marshals along the course—current students, parents, and teachers—and they were all friendly and encouraging. “Thank you, alumnae!” one father hollered as Moira and I passed his station. “Keep it up, ladies!” called Ms. Clarke, the gym teacher, exactly the same as she did when we were in class 15 years ago. Thankfully, Ms. Clarke wasn’t assigning us grades this time. Moira and I completed the first lap in the neighborhood; as we reached the point to do another one, the race marshal asked if we wanted to walk the entire 5K or turn back to campus, which would leave us a with a one-mile “fun walk” under our belts. Knowing the hills that were awaiting us on the second lap, I almost said we should go back to school, but squashed that instinct. Moira agreed: we had signed up for the 5K and were going to do the whole thing. And actually, the second lap felt easier (though my RunKeeper times tell me I’m wrong about that, as we definitely slowed down a bit). But the second lap also felt a lot emptier—the runners, including Maureen and Jackie, had all passed us on their own second lap and were already back on campus. As Moira and I walked down the last section of the neighborhood loop, I looked behind us and realized that I couldn’t see anyone. We were the last two out on the course. We left the neighborhood, crossed the street, and walked through campus. 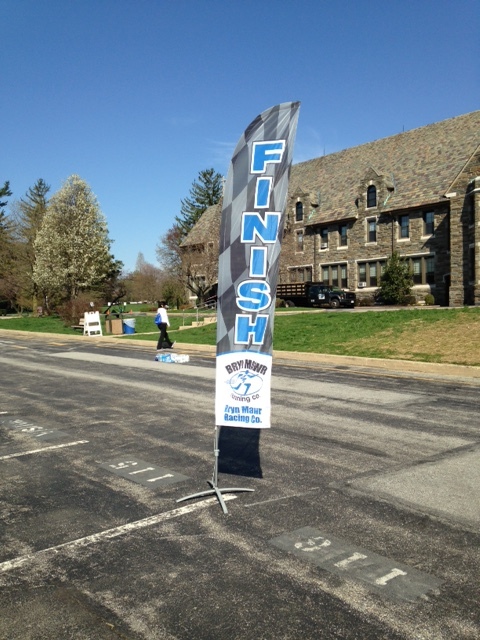 As we approached the finish line, we saw the timekeepers packing up their stuff. OMG, we finished dead last. But we finished, and that’s what mattered. No pictures on the scorecard. And, incredibly, Team 2000 even won something! Maureen won our age division, and the four of us won the best all-female team category. (How many all-female teams were there? Shhh. No pictures on the scorecard.) We were evidently not the only ones surprised that our team won. “Now, I don’t remember you ladies being the most athletic group,” smiled Mrs. Killeen, the director of admissions. We all admitted that was true. I looked up the race results when I got home, and I’ll admit, it stung a little bit to see my name at the very bottom of the page (officially, I came in 104 out of 105 runners and Moira was one second behind me—but we really crossed the finish line at the same time). And I’d set a goal for myself of finishing in 45 minutes, which I did not meet (those damn hills). But I did finish, and I didn’t take the easier option of stopping after one mile when it was presented to me, a fact of which I am somewhat proud. I had fun and got to catch up with friends I have not seen often enough over the past 15 years. I supported a good cause that I believe in. And I gave myself a time to beat—because I’m pretty sure I can do better. Even if I don’t: no pictures on the scorecard. Way to go Maura, Moira, Maureen and Jackie!! !